The nation’s Latino population is diverse. Represented among the 51.9 million Latinos in the United States are individuals who trace their heritage to more than 20 Spanish-speaking nations worldwide. But one group—Mexicans—dominates the nation’s Latino population. Following Mexicans and Puerto Ricans are Salvadorans, Cubans,2 Dominicans, Guatemalans, Colombians, Spaniards, Hondurans, Ecuadorians, Peruvians, Nicaraguans, Venezuelans and Argentineans. Together these 14 groups make up 95% of the U.S. Hispanic population.3 Among them, six Hispanic origin groups have populations greater than 1 million. 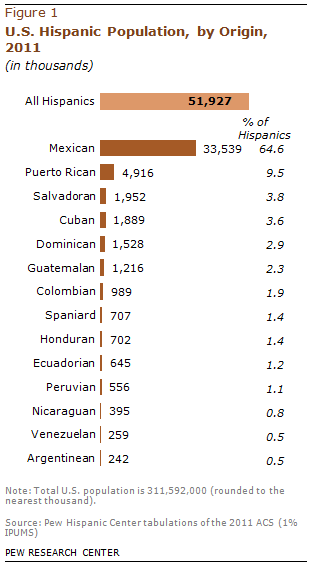 Mexican-origin Hispanics have always been the largest Hispanic-origin group in the U.S. In 1860, for example, among the 155,000 Hispanics living in the U.S., 81% were of Mexican origin—a historic high. 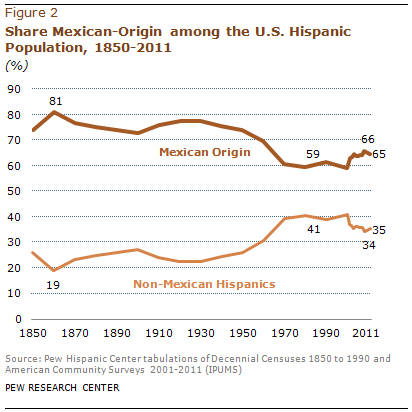 Since then the origins of the nation’s Hispanic population have diversified as growing numbers of immigrants from other Latin American nations and Puerto Rico settled in the U.S. For example, between 1930 and 1980, Hispanics from places other than Mexico nearly doubled their representation among U.S. Hispanics, from 22% to 41%. But with the arrival of large numbers of Mexican immigrants in the 1980s and 1990s, the Mexican share among Hispanics grew, rising to a recent peak of 66% in 2008. Since then it has declined slightly—to 65%—as Mexican migration to the U.S. has slowed (Passel, Cohn and Gonzalez-Barrera, 2012). The nation’s Hispanic-origin population differs in many other ways as well. For instance, U.S. Hispanics of Mexican origin have the lowest median age, at 25 years, while Hispanics of Cuban origin have the highest median age, at 40 years. Venezuelans are the most likely to have a college degree (51%) while Guatemalans and Salvadorans are among the least likely (7%). Argentineans have the highest annual median household income ($55,000) while Hondurans have the lowest ($31,000). Close to half (46%) of Hondurans and Guatemalans do not have health insurance while 15% of Puerto Ricans and Spaniards do not have health insurance. Further comparisons and rankings of the nation’s largest Hispanic-origin groups are shown in the appendix of this report. Hispanics are also the nation’s largest immigrant group and one of its fastest growing populations. According to the Census Bureau, Hispanic population growth between 2000 and 2010 accounted for more than half of the nation’s population growth (Passel, Cohn and Lopez, 2011). Among the nation’s 40.4 million immigrants, nearly half (47%) are Hispanic (Motel and Patten, 2013). Accompanying this report are 14 statistical profiles—one for each of the 14 largest Hispanic-origin groups. Each statistical profile describes the demographic, employment and income characteristics of a Hispanic-origin population residing in the 50 states and the District of Columbia. Each origin group’s characteristics are compared with all Hispanics and the U.S. population overall. This report examines the Hispanic population of the United States by its 14 largest origin groups. The data for this report are derived from the 2011 American Community Survey (1% IPUMS), which provides detailed geographic, demographic and economic characteristics for each group. Accompanying this report are profiles of the 14 largest Hispanic-origin groups—Mexicans, Puerto Ricans, Salvadorans, Cubans, Dominicans, Guatemalans, Colombians, Spaniards, Hondurans, Ecuadorians, Peruvians, Argentineans, Nicaraguans and Venezuelans. Also accompanying this report is an interactive graphic analyzing these groups on several characteristics. The authors thank Paul Taylor for editorial guidance. Eileen Patten checked numbers in the report. Molly Rohal was the copy editor.